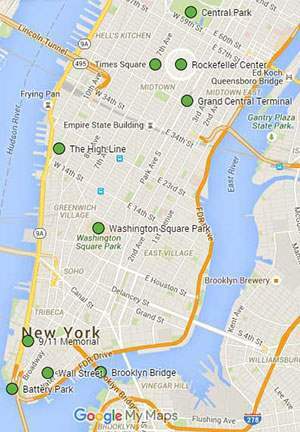 If you’re planning your first trip NYC, the sheer number of landmarks to visit could be overwhelming. So we boiled it down to our Top 10 “Must See” places, with some interesting historical tidbits and food and coffee recommendations near each one. This free New York City guide includes Wall Street, the High Line, Grand Central Terminal, Washington Square, Central Park, and more. We wrote it with first-time NYC visitors in mind, so that you could use it to help you plan your trip and make the most of your time in the city. The list above is organized geographically, generally south to north. And if you don’t have time to read 10,000 words on your screen right now, click here to get this as a free and printer-friendly PDF file that you can take with you. New York City welcomes approximately 60 million tourists each year. Sadly, a lot of first-time visitors spend a disproportionate amount of their limited time in New York around Times Square – whether it’s for eating, shopping, sightseeing, or entertainment. And, of course, there is nothing wrong with visiting Times Square or seeing a Broadway show (in fact, Times Square makes this very list! ), it’s just that New York is so much more than that. So, in short, we hope you will use this list to more effectively plan your trip to New York and to get a really nice overview of what our city has to offer. Be sure to also check out our self-guided 1-Day NYC Itinerary! And if you’d rather explore NYC with a fun local guide, check out our custom NYC private tour options, including our popular “NYC In One Day” Highlights Tour. This free guide is geared towards first-time visitors to New York City, although repeat visitors who didn’t venture too far out of Times Square the last time around should find it useful as well. 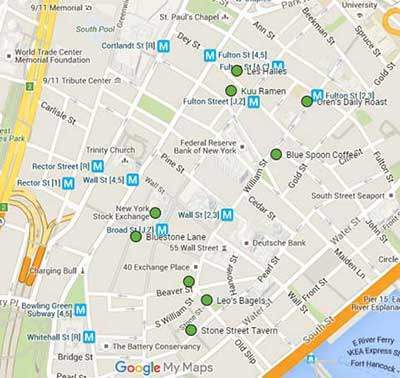 It is meant to help you explore the city on your own, kind of like a mini self-guided tour. This list of famous places is inevitably incomplete and subjective. There is simply no way to cram all that is worth seeing in New York into a “Top 10” post. And if you ask a hundred New Yorkers about their “Top 10” you will likely get a hundred different responses. So don’t trust any lists about things to do and see in New York that contain words like “definitive” or “authoritative”. We intentionally excluded museums from this list, because this could have easily become the “Top 10 Museums to Visit in New York City” post. As an aside, Wikipedia’s List of Museums in New York City exceeds 200 entries! It is focused on top attractions in Manhattan (with the exception of a walk over the Brooklyn Bridge into Brooklyn). That is not because there is nothing to do or see in Brooklyn, Queens, the Bronx, or Staten Island (the opposite is true), but simply due to the fact that most of the most iconic, famous, and historic sights and landmarks in New York City are located in Manhattan. And given that this post is geared to first-timers, it is only natural that we’d stick to (mostly) Manhattan. It is not just a checklist with pretty pictures (like a lot of the other posts out there on this topic, where you have to click “Next”). We provide interesting historical tidbits and background info to help you learn a few things about what you plan to see. 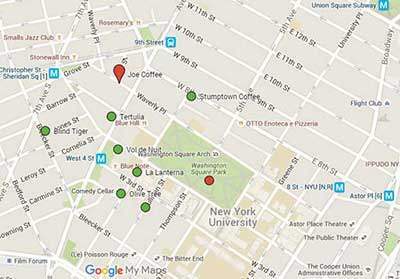 We also suggest good places to eat, drink, and get a great cup of coffee near these landmarks. Finally, we provide the best way to get to each landmark by subway. Speaking of the subway, if you’ve never used the NYC subway, check out our helpful Subway “Beginner’s Guide”! The place to start your NYC exploration is all the way Downtown, at the southern tip of the island of Manhattan, because this is where it all began. It is here that the Dutch first settled on the island and established New Amsterdam (1625). It is also here that the English took over in the “Bloodless Surrender” of 1664. It is at the southern tip of the famous island that millions of poor European immigrants stepped onto American soil to start a new life. It is also here that NY developed into the most important shipping port on the East Coast, the center of American finance (Wall Street), and the 20th century skyscraper colossus. Downtown was also traditionally home to the largest corporations in the world – shipping, oil, banking, insurance, you name it. On a tragic note, Downtown has also been the location of the worst terrorist attacks in city history – from the 1920 Wall Street bombing to the 1993 World Trade Center bombing to the worst terrorist attack in American history on September 11, 2001. Stroll through Battery Park until you get to the water’s edge. Today’s edge is actually man-made in the sense that Battery Park was created using landfill in the 19th century. The natural southern edge of Manhattan before numerous man-made extensions was Pearl Street (named for the oyster shells that washed ashore), while the western water line was approximately where State Street cuts between Battery Park and the Downtown skyscrapers. Now, you might be wondering, “Why am I walking through a park named after batteries?” While that’s a legitimate question, Battery Park is actually named after a military fortification with cannons (as in a “cannon battery”). So the name has nothing to do with the batteries in your smartphone or camera. Speaking of batteries, the one thing that existed before Battery Park was the Southwest Battery, built on some rocks just off the tip of Manhattan island. The Battery was later renamed Castle Clinton in honor of DeWitt Clinton – mayor then governor of New York. This stone fort was built in preparation for the War of 1812 to dissuade the British from attacking New York City again. They didn’t, though they did manage to burn down the White House and most of the other public buildings in Washington D.C. on August 24, 1814 (but, apparently, after enjoying a nice meal inside the abandoned White House from Presidential leftovers). After the brief war, the fort was used for several diverse and decidedly non-military purposes. First, as “Castle Garden” it served as a theater and entertainment space. Then, between 1855 and 1890, Castle Garden served as an immigrant landing depot, processing 8 million immigrants in just under 35 years! After the immigrant processing was relocated to Ellis Island, Castle Garden served as the unlikely location for the NYC Aquarium until 1941. 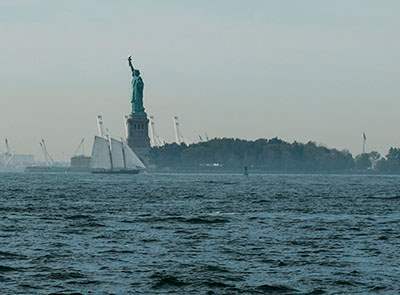 Today, it is a National Monument (restored to its original design and name) that also serves as the place to buy tickets to visit the Statue of Liberty and Ellis Island, although the Castle Clinton website suggests that you buy tickets in advance online at statuecruises.com to avoid waiting up to hour to buy them in person the day of. If you’re short on time or money (ferry tickets to Liberty and Ellis Island start at $18), you can take a free 25-minute cruise across the NY Harbor by using the Staten Island Ferry. 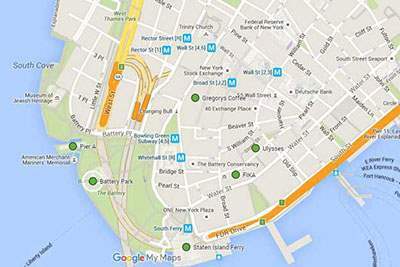 The ferry terminal (very clearly marked with huge blue letters) is in Battery Park, just south of Castle Clinton. Check out the Staten Island Ferry schedule for detailed departure times, but generally, the boats depart every half hour. Important: Ignore all the ticket sellers trying to sell you something on the way to the ferry terminal. On a clear day, the views are wonderful, and you get pretty close to the Statue of Liberty for great photos. You also get to see a bit of Brooklyn, Governor’s Island, New Jersey, the East River bridges, and the Hudson River. The only downside is that when you get off the boat at the Staten Island terminal, you have to sit around for another half hour before taking the next ferry back to Manhattan (unless you make a run for it, like all the other tourists! You’d have about 3 minutes to get off the boat, run around the terminal and get on the other boat departing back to Manhattan). If you miss it, you can use the time to visit the bathroom or grab a small snack inside the terminal. All in, the round-trip excursion should take about 60 to 90 minutes (60-min if you catch the departing ferry). And you don’t have to worry about waiting in line for tickets going through a security screening (big bottlenecks when buying Statue of Liberty/Ellis Island tickets). And if you are so short on time that you can’t spare 90 minutes for the Staten Island Ferry, then you can simply enjoy the marvelous views from the water’s edge in Battery Park. 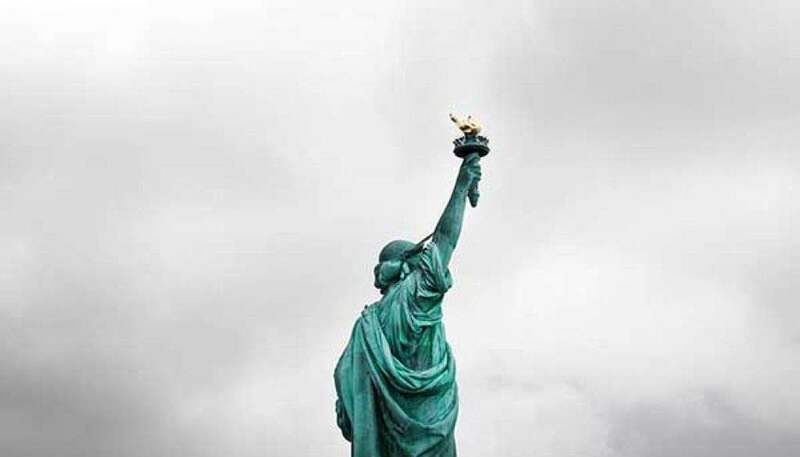 You’ll need a telephoto lens to get a close-up view of the Statue of Liberty, but she still looks great from a distance, especially given her age (130+ years young!). Getting here: R to Whitehall, 1 to South Ferry (make sure you are in the first five subway cars if you want to get off at South Ferry), or 4/5 to Bowling Green. Download the official NYC Subway Map as a PDF here. Pier A Harbor House: Visit the beautifully restored Pier A just north of Castle Clinton for a pint of beer on tap and some good bar food (there is also a casual café inside and a fancier restaurant upstairs). This recently opened restaurant and bar space is located inside a landmark structure completed in 1886 for the NYC Dept. of Docks and Harbor Police. Grab a table by one of the windows overlooking the harbor. Take a 10-minute walk to Stone Street for a great variety of bars and restaurants on one quaint cobblestone street (the first paved street on Manhattan), including Ulysses’ (popular pub), Adrienne’s (pizza), and more. The term “Wall Street” needs no introduction. When you hear it you probably think of money, stocks, trading, banking, expensive suits and briefcases, stock market bubbles and panics. It’s been portrayed in countless movies and TV shows, including Oliver Stone’s 1987 classic starring Michael Douglas and Charlie Sheen (when he was still relatively normal) appropriated called “Wall Street”, as well as more recent hits like Martin Scorsese’s “The Wolf Of Wall Street”, starring Leonardo DiCaprio, although the high-flying (and fast-crashing) events and characters in this movie don’t take place on Wall Street at all. Hollywood stereotypes aside, Wall Street actually has very humble beginnings as a wooden wall built by the Dutch in 1653 as a defensive barrier. It marked the northern end of the small colony of New Amsterdam on Manhattan’s southern tip. Yes, the name Wall Street is literally derived from that wooden wall built more than 350 years ago! The wall proved useless and was torn down and used for lumber and firewood by the British at the end of the 17th century. If you’ve visited Battery Park, you can walk north on Broadway, passing New York’s first park — Bowling Green – and the famous bronze Charging Bull sculpture. In a few minutes, you’ll see the beautiful brownstone steeple of Trinity Church (spoiler alert: this is where Nicholas Cage discovers the treasure at the end of National Treasure). The church, built in 1846, used to tower over Wall Street for half a century. In fact, its steeple was the tallest point in the city until the very end of the 19th century. Today, of course, it’s dwarfed by 20th and 21st century skyscrapers. The most famous resident in the church’s graveyard is Alexander Hamilton, the same Hamilton whose life and times are depicted brilliantly in the award-winning Broadway musical bearing the American Founding Father’s name. Check out our Alexander Hamilton themed private NYC walking tour, if you are interested in American history and many of the people, events, and places depicted in the musical. Make a right on Wall Street and head to the next corner. This is essentially the “heart of Wall Street”, with the New York Stock Exchange on your right, the Federal Hall Memorial on your left, and the former “House of Morgan” occupying the squat stone building at 23 Wall Street. It was in front of this former J.P. Morgan headquarters that NY experienced the deadliest terrorist attack until 9/11 81 years later. On September 16, 1920, a horse-drawn wagon loaded with explosives and cast-iron slugs exploded during the peak noon-time lunch rush, killing 38 people and injuring more than 300 others. Chaos ruled the day. The NYSE closed, as did the banks. Italian anarchists were blamed, but since not a single arrest was made (no suspects were found), this terrible crime remains unsolved nearly a century later! If you look at the stone wall of the building on the Wall Street side, you can still see the pock marks from that powerful explosion. On a lighter note, this building was prominently featured in The Dark Knight Rises (2012), where Bane takes over the Stock Exchange. Right across is the oversized bronze statue of George Washington. It was on this site that he was inaugurated as America’s first president on April 30, 1789, in America’s first capital – New York City! If you didn’t know that NYC was America’s first capital, don’t worry, most New Yorkers don’t know that fact either. The original building where he was sworn in was demolished two centuries ago, but the current building (built in 1842 and modeled on the Parthenon in Greece) now serves as a museum. Inside, you can view a piece of the balcony Washington stood on to address the adoring public, as well as the Bible he put his hand on during the swearing-in ceremony. Getting here: R to Rector St, or 2/3/4/5 to Wall Street. Open Kitchen – 15 William Street. A casual lunch place with a good variety of hot and cold options at reasonable prices. Kuu Ramen – 20 John Street. Great hole-in-the-wall ramen noodle place. No trip to New York City would be complete without a visit to the 9/11 Memorial, so make sure it’s high on your list. The Memorial, which opened to the families of the victims (then the general public) on the 10th anniversary of the attacks, is comprised of two identical pools with cascading water that mark the footprints of the Twin Towers (actually, the pools are 31% smaller than the tower footprints were). Each pool is 30 feet deep. 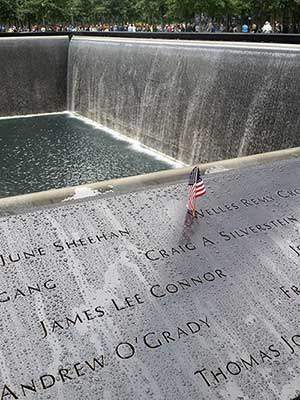 The names of the nearly 3,000 victims of the 1993 WTC bombing and the attacks on 9/11 are inscribed on bronze parapets surrounding the pools. As you can imagine, the design of the memorial was a very contentious topic (as was the WTC redesign in general). Progress was only made after a design competition in 2004, which attracted 5,201 design ideas. Of these, one was chosen. The winner of the competition was a 34-year-old (and relatively unknown at the time) Israeli American architect named Michael Arad. He called his design “Reflecting Absence”. Just west of the South Pool, surrounding by a metal railing, sits the “Survivor Tree”. This living thing is arguably the best metaphor for how far we’ve come since that terrible day. The tree was found in the rubble a month after the attacks. It was badly burned and broken, its roots snapped. The tree was removed from Ground Zero and placed in the care of the NYC Parks Department. It was nursed back to health and brought back to the site in 2010. If you look at the base of the tree, you can see the damage inflicted on that terrible day, but if you look up, you can see healthy new branches and leaves – ultimate symbols of new life. Check out this wonderful 2-minute video about the “Survivor Tree”. If you have the time, you can also visit the 9/11 Museum, which is the downward-sloping building between the two memorial pools. The regular tickets are $24, but there is “Free Admission Tuesdays”, when you can get in for free from 5pm to 2 hours before closing time. The average time of a museum visit is 2 hours, so make sure you give yourself enough time to really do it justice. Last entry is at 6pm Sunday through Thursday and 7pm Friday and Saturday. The Museum is a very emotional experience, thus the strategically placed tissue dispensers inside. You gradually descend 70 feet to the bedrock level. There is a historical component, as well as a memorial component. There is also a private section where the unidentified remains of many of the victims were interred. This section is off limits to the public, but families of victims can reserve private time in the Reflection Room. Surrounding the 9/11 Memorial and Museum is the redesigned World Trade Center complex. The flagship building is One World Trade Center, the tallest building in the Western Hemisphere (for now). The 400-foot spire gives it a total height of 1,776 feet – not coincidentally, the year Americans declared Independence. Check out this video from NBC Nightly News showing the final segment of the spire being put into place. The nearby 4 World Trade is complete and features the popular Italian food court called Eataly upstairs. 3 World Trade was completed in 2018, while 2 World Trade is still in the early stages of construction. This tower will be nearly as tall as 1 World Trade and will feature cubes of gradually smaller dimensions stacked on top of each other. Check out this Wired Magazine article about the building’s design and its architect, which also includes a sleek promotional video at the top. The last big piece of the puzzle is the dinosaur-skeleton-like WTC Transit Hub, also known as the “Oculus”, designed by Spanish celebrity architect, Santiago Calatrava. This $4 billion “boondoggle”, as the NY Times architecture critic, Michael Kimmelman, called it, cost double its original budget. It was initially supposed to look like a bird with its wings spread, but a few compromises and redesigns later, it looks more like an armadillo with asymmetrical bone spurs. The Hub features a high-end shopping mall component, a cafe, as well as passageways connecting numerous NYC subway lines to the PATH trains to New Jersey. The Oculus is one of those buildings that grows on you the more time you spend inside, so be sure to peak in. It might be one of the newest additions to the NYC architectural landscape, but it has already become a “must see” building when visiting New York. Downtown Manhattan is so rich in history and famous landmarks that you could easily spend a day exploring the area. But if your time is limited and you’d rather explore it with a local guide on an intimate private tour, check out our 3-hr Downtown Highlights walking tour. Getting here: R to Cortlandt St, or A/C/2/3/4/5 to Fulton St. The best place to get a bite to eat near the World Trade Center is at the upscale food hall called Hudson Eats just across the road. The space, which opened in 2014, features a great variety of local food vendors in a clean modern setting. There are lots of seating options and great views of the Hudson River. If the weather is nice, take your order to go and find a table outside by the expensive yachts. To get there, cross Route 9A, or what most New Yorkers still call the West Side Highway, at Vesey street. Look for a building with a large “Brookfield Place” sign and head inside. The food court is on the 2nd floor, and despite its upscale appearance the prices are actually quite reasonable, at least by New York City standards. There is also a popular French food hall called Le District right underneath Hudson Eats. It’s a great stop if you’re craving crepes, coffee, or a glass of wine. To get here, walk inside Brookfield Place, pass all of the really expensive stores, and look for the palm trees in the beautiful Winter Garden. You’ll see Le District on the first floor and Hudson Eats above it. Visiting New York and not walking over the Brooklyn Bridge is considered a misdemeanor. OK, so maybe that’s stretching the truth a bit, but at the very least, it’s a sin. So skip a shopping excursion at Century 21 or the M&M store in Times Square and instead head over one of the (if not the) most iconic bridges in America. This marvel of engineering is magnificent – a brilliant bridge and a true work of art. “What’s the big deal?” you may think. “It’s just a bridge.” Yes, but how many bridges do you know that were called the “8th Wonder of the World” at the time of completion? The Brooklyn Bridge is considered one of the top 3 engineering achievements of the 19th century in America, along with the Transcontinental Railroad and the telegraph cable on the bottom of the Atlantic Ocean. It was the first bridge to connect America’s largest city, New York, with its third-largest, Brooklyn (which was an independent city until 1898). It was also the first bridge to be suspended entirely using steel cables. Think about it for a second, a bridge completed in 1883 in the horse-and-carriage age is being used by millions of pedestrians and drivers each year – more than 135 years later! It is the only part of the city skyline that has not changed in over a century. The impressive stone towers alone were considered architectural and engineering marvels, especially in the 1870s, half a century before the Jazz Age skyscrapers like the Chrysler Building and Empire State. Most of the steel cables for the bridge were supplied by Roebling & Sons, the same famous wire manufacturing firm that supplied steel wires for the George Washington Bridge, Golden Gate Bridge, Verrazano-Narrows Bridge, and many other important suspension bridges built between 1850 and 1970. More than 20 people died during the 14-year construction process. Some died from accidents, while others died from a mysterious condition known as “the bends” or “caisson disease”, better known as decompression sickness today. Tragically, the first victim claimed by the bridge was its original designer and Chief Engineer, John A. Roebling. And this is just skimming the surface. There is so much more to the incredible story of the Brooklyn Bridge. 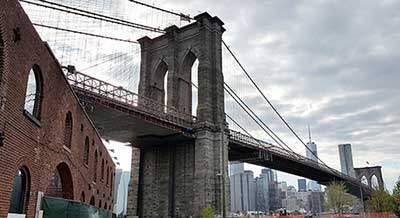 To learn more about the Bridge and Brooklyn, check out our popular (and custom/private) Brooklyn Bridge Tour. It really doesn’t matter whether you go from Manhattan to Brooklyn or vice versa. It all depends on what you plan to do before and after. If you plan on having lunch after the walk, then we suggest walking from Manhattan to Brooklyn, since there are a few great options for lunch, drinks, coffee, and sweets in Dumbo and Brooklyn Heights (two historic neighborhoods near the bridge on the Brooklyn side). We include some food suggestions below. The Fulton Ferry Landing in Brooklyn offers spectacular views of the Manhattan skyline and the bridge. On a nice day, you can then take a stroll through the new Brooklyn Bridge Park, an incredible public space built on and around abandoned shipping piers on Brooklyn’s waterfront. If you choose this route, there are several subway lines nearby for a quick ride back to Manhattan, or you can take a scenic cruise on the NYC Ferry, which has a dock right by the Fulton Ferry Landing. One-way tickets are $2.75 (just like the NYC subway). Alternatively, if you prefer to start in Brooklyn and walk over the bridge into Manhattan, you can take the F train to York St, the A/C to High St, or the 2/3 to Clark St, then walk to the stairs to the bridge on Washington St, just up the hill from York St. If you take this route, you can visit Saint Paul’s Chapel once you get to the Manhattan side. This is the oldest surviving public building in New York (circa 1766) and served as a disaster recovery site after the terrorist attacks on 9/11. This historic church is very near the new World Trade Center and the 9/11 Memorial & Museum. So that’s something to keep in mind if you’re trying to plan your day. If you want to walk over the Brooklyn Bridge from Manhattan to Brooklyn, then take the R to City Hall or 4/5/6 line to Brooklyn Bridge/City Hall. If you plan to walk from Brooklyn to Manhattan, then take the F train to York St, the A/C to High St, or the 2/3 to Clark St.
You’ll get more local variety on the Brooklyn side of the Bridge, as far as food, drinks, and coffee go. 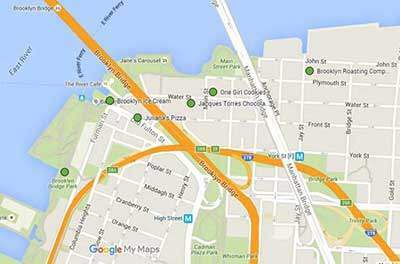 Pizza: Grimaldi’s or Juliana’s – right next to each other (Juliana’s is at 19 Old Fulton St, Brooklyn). Go where the line is shorter, although we prefer Juliana’s. Read this article about the behind-the-scenes pizza drama. AlMar: Popular neighborhood Italian restaurant, bar, and cafe, serving breakfast, lunch, dinner and drinks. In a city known for its hustle & bustle, noisy traffic, and canyons of skyscrapers, there are surprising pockets of relative peace and quiet. There are numerous historic districts with very well-preserved 19th century housing stock in Manhattan and Brooklyn. One of Manhattan’s oldest and most famous historic districts is Greenwich Village. It is considered Manhattan’s first “suburb”. Two centuries ago it was far enough away from the gangs and slums of the Five Points, the pigs roaming the streets scavenging for food, and the contagious diseases that spread like wildfire, especially in the summer months, to make it an attractive and leafy middle-class (then upper-class) retreat. Today, it is a popular and vibrant neighborhood in “Lower” Manhattan. To get to leafy suburbs these days, New Yorkers must drive over bridges or through tunnels to get off of the island of Manhattan. Many locals would agree that the “heart” of Greenwich Village is Washington Square, so you should start your exploration there. But first, here is some creepy background info on this famous park. Long before this became a park and the surrounding area a leafy well-to-do “suburb”, the land was used as a potter’s field – a mass burial ground for poor people. Between 1797 and 1826, it is estimated that 20,000 dead people were buried here. Many of them were the poorest of the poor and victims of various epidemics (especially yellow fever) ravaging the population in the densely packed slums, where dwellers lacked access to clean drinking water or proper bathroom facilities. Bathing was out of the question (one needed a bathtub, soap, and clean water for that). The logical thing to do was to dump the dead bodies far enough away from the city limits, but close enough so that the poor fellow driving the horse-drawn wagon full of decomposing corpses wouldn’t have to drive too far. The unattractive and undeveloped land that is now Washington Square was the perfect place for this macabre task. OK, enough about yellow fever epidemics and burial grounds. Washington Square became a military parade ground named in honor of George Washington in 1826, which coincided with the 50th anniversary of the signing of the Declaration of Independence. This brings us to the most obvious structural element in Washington Square – the marble Washington Memorial Arch. If it looks familiar, that’s because the architect who designed the classical arch modeled it on the Arc de Triomphe in Paris. This one is actually the permanent arch completed in 1895. The original, made of wood and plaster (and designed by the same architect) was built in time for the 1889 parade to celebrate the centennial of George Washington’s inauguration as America’s first president on Wall Street. The temporary arch was so well-received that the city commissioned a permanent one. By the way, the “celebrity” architect who designed both arches was a dapper social butterfly and notorious womanizer named Stanford White, who had a serious walrus mustache. Sadly, this famous architect was killed by a very jealous and crazy husband of one of White’s ex-mistresses – the beautiful Evelyn Nesbit. He was killed in 1906, 11 years after the marble arch in Washington Square was completed. His famous mustache (along with the rest of his face) was obliterated by three point-blank pistol shots to the face. If you want read a great book about him, Evelyn, the crazy husband, and the subsequent “Trial of the Century”, check out American Eve by Paula Uruburu. Putting aside White’s gory death, go take a peek at what’s left of “Millionaire’s Row” – considered one of the best preserved and fanciest rows of 19th century homes in New York City. If you step through the arch looking north (towards the Empire State Building), you will see a beautiful row of matching red-brick houses with marble Greek Revival columns. These homes were built in the early 1830s to house wealthy merchants, bankers, lawyers and, of course, their sizable families and crews of domestic servants. Prominent families living in these imposing homes would show off their latest fashions on a Sunday afternoon stroll through Washington Square — the place to see and be seen in the 1830s. And when it was time to commute to their Wall Street offices or take a vacation in the “country”, their servants would pick them up out front in one of several fancy carriages conveniently kept behind the houses on Washington Mews. You can view these historic carriage houses today by taking a stroll on what’s left of the cobblestones on this quaint narrow lane just behind the “Row”. Today, most of the rowhouses and carriage houses are owned by New York University. Here is one last tidbit for all you movie buffs reading this: Will Smith’s character in I Am Legend (2007) – the scientist living in post-apocalyptic New York with his German shepherd – resides in 11 Washington Square North. Here is clip from the movie in which zombie’s swarm Washington Square. Now, get out there and explore the beautiful surroundings! Don’t worry if you get lost, you’re safe here. And there is a great café, restaurant or bar around every corner. This is a hard one because this area is full of great options for food and drinks. So here are just a few to sate your hunger and quench your thirst. Looking for great pizza? Check out our blog post on 5 great places to get pizza in Greenwich Village. Caffe Reggio – 119 MacDougal Street. We had to include this one not because the coffee is very good – it’s not – but because this place has been around since 1927 and features a huge shiny espresso machine from 1902 that the café’s original owner, Domenico Parisi, bought with his life savings. Come in for some tea and dessert. The High Line is unique public park created on top of an abandoned elevated rail line on the west side of Manhattan. Almost a decade later, the High Line is attracting 8 million visitors a year and is ranked as one of the top things to do in NYC, according to TripAdvisor! “If it’s already so busy and popular, why should I visit?” If you’ve never been, it’s a must-do. The High Line is one of the best examples of adaptive reuse in the world. Built as an elevated rail line for freight trains in 1934 and effectively abandoned 30 years later, the metal structure became a blight on the area and was ripe for demolition. By 1999, it was in such a state of disrepair that city officials and property owners fretted that falling debris was bound to kill somebody soon. On May 16, 1999, the NY Times quoted the director of Mayor’s Office of Emergency Management at the time: “”It’s only a matter of time before someone is killed by falling debris,” he [Jerome M. Hauer] said. ”They can either pay for the demolition or pay the widow of the person killed.” Little did he (or the property owners voicing the same opinions) know that a decade later not only would pedestrians walking under the High Line be perfectly safe from falling debris (or most other dangers) but that pedestrians walking on the High Line would be even safer. And the property owners previously in the demolition chorus have made out like bandits, with a block in Chelsea next to the High Line recently selling for $870 million! The High Line has completely transformed the west side of Manhattan. It was built along the industrial west side, close to the shipping piers along the Hudson and the factories and warehouses of the Meatpacking District and Chelsea. Today it snakes between (or through) some of those same old factories and warehouses. The big difference is what’s next to these old industrial buildings: Condos, condos, and more condos (and some office buildings too). Some of the most interesting, expensive, and innovative new construction over the last decade has taken place near the High Line. Celebrity architects are tripping over each other trying to build the next headline-grabbing building, like 520 West 28th st. Walking on the High Line is the ultimate study in contrasts – the old brick and stone versus the new glass and steel. Many of the old industrial buildings have fared pretty well too. Two standouts worth mentioning is the century-old Nabisco cookie factory converted to Chelsea Market in the 90s and the Cass Gilbert-designed packaged foods warehouse ten blocks north, which is now an exclusive K-12 private school with annual tuition exceeding $47,000! The High Line allows you to get a new vantage point on New York City – 30 feet above the noisy cabs and trucks, the crowded streets, and the general hustle and bustle of the city. It’s called a “Park in the Sky” for a reason – it’s the first elevated park in America (which has inspired numerous “park” ideas around the world). The High Line affords the best views of the massive new Hudson Yards development, NY’s largest private construction project since Rockefeller Center (built in the 1930s). 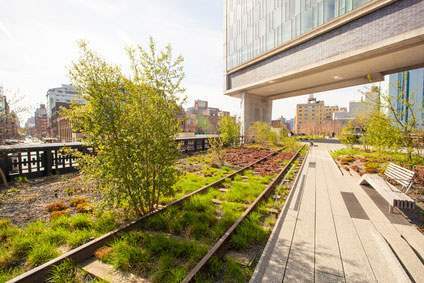 Visit the High Line’s northern spur (between 30th and 34th streets) for the best views. To sum it all up, visit the High Line for the river and skyline views, the incredible variety of architecture, the people-watching opportunities, and the uniqueness of the public space itself. And if you like Ted Talks, check out this short talk by Robert Hammond (the co-founder of the Friends of the High Line) recorded almost 2 years after the opening of Section 1. Getting here: The High Line has multiple access points (stairs or elevators) along its 1.5-mile length, from 34th street and 11th avenue down to Gansevoort Street in the Meatpacking District. You can either start at the bottom and work your way up (north), or vice-versa. If you are short on time, you can also access it somewhere in the middle (at 23rd street, for example). A/C at 14th street and 8th avenue, C/E at 23rd street and 8th avenue, or 7 to 34th street/Hudson Yards. The last one is the best option if you want to start at the top and work your way down, which is ideal if you want to visit the new Whitney Museum or get a bite to eat after walking the High Line. The street hookers and drug dealers may be gone from Manhattan’s former “Wild Wild West”, but at least you can now get a nice bite at prices that won’t leave you feeling dirty and used. Chelsea Market – takes up an entire block between 10th and 9th avenue and 15th and 16th street, built more than a century ago by the National Biscuit Company. Impressive food variety, good coffee, beer, wine, even some shopping. Bubby’s High Line – 73 Gansevoort street – right across the street from the High Line’s southern terminus and a stone’s throw from the entrance to the Whitney Museum. American-style food and drinks in a trendy setting, with a focus on seasonal and locally-sourced ingredients. They also serve delicious ice cream from Brooklyn’s Ample Hills Creamery! SweetGreen MePa and Hudson Yards — popular, healthy, “fast-casual” lunch chain with two locations near either end of the High Line. Old Homestead – 56 9th Avenue (between 14th and 15th street) – one of the oldest steakhouses in America (circa 1868), it has served huge chunks of beef at the same location for nearly a century and a half! Worth a splurge if you want a proper NY steakhouse experience. Why is Times Square on our list if we moaned about how not enough tourists venture far enough out of Times Square at the start of this post? Well, it’s because Times Square is still a “Must Do” if you’ve never visited in person. You’ve seen it in countless movies, but there is nothing like actually standing in the middle of it, especially at night, and just doing a slow 360-degree turn trying to absorb all the lights and sounds. Times Square is the epitome of sensory overload. According to the Times Square Alliance, the famous public space is visited by 300,000 pedestrians each day. This number includes an eclectic collage of stressed office workers in business attire fighting past the crowds while checking their phones, tourists blocking the sidewalk to gawk at a billboard or take a photo, ticket hawkers asking passersby if they “like comedy”, superheroes and cartoon characters competing for tourist photos (and the tips they will chase you for), Naked Cowboy (who makes $150,000 a year playing guitar in his underwear) and nearly naked “desnudas”, plus the guy with the cardboard sign that reads: “I WON’T LIE, I NEED THE MONEY FOR WEED”. Times Square has been called a lot of things over the last century. And we New Yorkers are not shy about using hyperbolic phrases, so here are the most common ones: The Crossroads of the World, the Center of the Universe, the Great White Way (not racist – has to do with the amount of light day and night), even the “Heart of the World.” And while no-one would take these nicknames at face value, they do speak volumes about how famous and recognizable this relatively small public space is. But despite its instantly-recognizable billboards and streetscape, it’s amazing how many tourists get the name wrong! Just go to google and start typing “Time Square” to see how many suggestions you’ll get based on Google’s search history. Or check out how many photos are tagged with #timesquare on Instagram – over a million! So what’s the problem here? The problem is that the area is not “Time” Square but “Times” Square, as in the New York Times. The famous newspaper moved “uptown” and built the Times Tower in 1904, the same year New York City agreed to change the name of the area from Longacre Square to Times Square. By the way, the second part of the name is also a bit tricky in that it’s not actually a square. It’s really a bowtie, as Broadway and 7th Avenue cross at 42nd street. But hey, Times Square sounds better than Times Bowtie, or “Times X”. If you’re wondering which building is the Times Tower, it’s the one with the bright shiny ball on the roof that’s featured every year on New Year’s Eve. You’ve probably seen it on December 31 countless times, but did you ever wonder how many people in the crowd are actually New Yorkers? Of the million people who cram into Times Square on New Year’s Eve each year, we’d “guesstimate” that about 99% are tourists. The other 1% are grumpy New Yorkers dragged there by their visiting relatives. You’d be grumpy too if you had to freeze behind police barricades all day for a few B-list celebrities and a 10-second countdown followed by a lot of confetti. In short, don’t go to Times Square on New Year’s Eve. Go there at night any other day of the year. Look around, take some memorable photos, go see a Broadway show. But please please don’t eat at Olive Garden, Hard Rock Café, or Bubba Gump Shrimp! 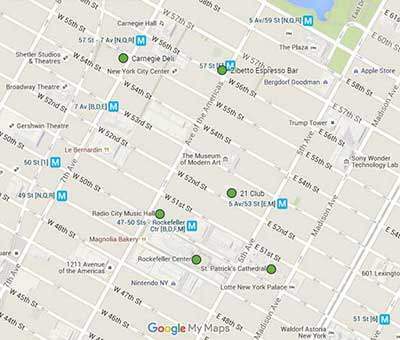 New York has its flaws, but a lack of dining options isn’t one of them. So why would you spend money going to a chain restaurant you can find in your hometown? Those unlimited breadsticks aren’t worth the 45 minute wait to get in (and the prices are high too). Instead, walk 10-15 minutes west to Hell’s Kitchen if you’re hungry. If you have time, read this interesting cover story on Times Square in the de Blasio era, written by Adam Sternbergh for New York magazine. If you like non-fiction and want to learn about the history and evolution of Times Square, check out this really well-written book: The Devil’s Playground: A Century of Pleasure and Profit in Times Square by James Traub. Taxi Driver (1976): This classic Martin Scorsese film, starring a young Robert De Niro, portrays a very different Times Square – long before Disney, Elmo, and family-friendly fun. Vanilla Sky (2001): The only time you’ll ever see Times Square completely deserted is in this movie! The Amazing Spider-Man 2 (2014): Times Square goes dark in this battle scene! 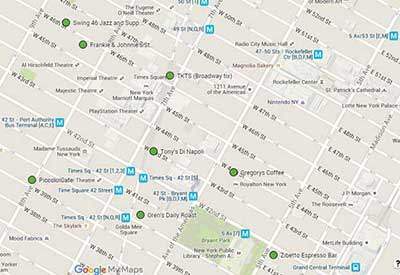 Getting here: Take the 1/2/3/N/Q/R/S/7 to Times Square/42nd street. It’s fair to say that Grand Central Terminal should make everyone’s Top 10 list. In fact, it’s hard to write about it without using a lot of superlatives. It’s an architectural marvel, an engineering masterpiece, and a spectacular living monument to transportation – all rolled into one enormous railroad terminal completed in 1913. It is the largest railroad terminal in the world (in terms of number of platforms). The 10-year ingenious construction process cost a whopping $80 million, or about $2 billion after adjusting for a century of inflation, all of which was privately funded! The Beaux Arts façade alone is colossal. Above the classical columns is a giant clock, 13 feet in diameter, featuring the largest example of Tiffany glass in the world. Atop the clock is the enormous limestone sculptural set called “Transportation”, featuring the Roman messenger god, Mercury (known for his speed), flanked by Hercules and Minerva. According to Wikipedia, Grand Central Terminal is one of the ten most-visited tourist attractions in the world. No surprises there. Just step through its doors and enter the Main Concourse to see why. 750,000 visitors pass through the terminal on a daily basis, but many of them are too focused on catching the 5:46 commuter train to the suburbs to stop and look around. The 125-foot vaulted ceiling alone is awe-inspiring. It features 2,500 stars and painted depictions of zodiac constellations (March through October). There is only one problem: The constellations are painted backwards, but we won’t dwell on that. Instead, try to find a dark spot near Cancer on the ceiling. Look for the giant crab and you should find a dark rectangular patch near one of the crab’s claws. What gives? After more than a decade-long restoration process in 90s, the entire terminal was restored to its original splendor. That included peeling off decades of grime and dirt from the walls, floor, and of course, ceiling. But as a permanent reminder of its sorry state in the past, one brick on the ceiling was left unrestored. And the biggest contributor to its dark color isn’t pollution — it’s tobacco and nicotine residue from countless cigarettes smoked by millions of commuters over more than half a century. Take a photo by the famous clock in the middle of the concourse, estimated to be worth anywhere between $10 and $20 million by Sotheby’s and Christie’s auction houses (its four faces are made of opal). For a century, “under the clock” has been the most common phrase uttered when deciding where to meet in Grand Central. By the way, the terminal and the clock take quite a beating at the end of this epic battle scene in the Avengers. Before taking one of the two marble staircases down to the Dining Concourse, take a quick look at one of the boards displaying the train schedules. One of the little secrets is that all train times are 1 minute ahead of the actual schedule. So take your time, because that 6:15 train to Stamford won’t actually depart until 6:16. Once you’re downstairs, look for the famous Oyster Bar, which is as old as the terminal itself. In front of the Oyster Bar is another beautiful vaulted ceiling, albeit much smaller and without stars and constellations. This tiled Guastavino ceiling offers a very interesting acoustic feature. If you and another person stand in opposite corners and face your respective corner (not each other, as some frustrated tourists do), you can speak into the corner and the other person will hear you as if you’re speaking on the phone. That’s why this spot is called the “Whispering Gallery”. It is not known if Rafael Guastavino, the famous Spanish designer behind this and many other vaulted ceilings in New York City, intended for this acoustic element, or if it’s just a byproduct of perfect symmetry and materials used. 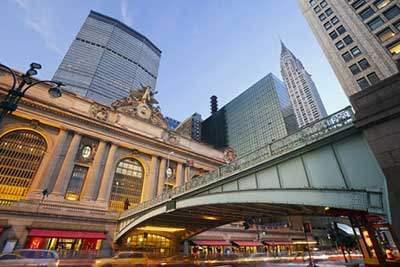 Here is one last little tidbit: The building we proudly call Grand Central Terminal is actually the third railroad terminal at this location. The original, the brainchild of “Commodore” Cornelius Vanderbilt, opened in 1871 and brought long-distance passengers into Manhattan on steam-powered trains for the first time. It was called Grand Central Depot. Three decades later, it was renamed Grand Central Station, after a major renovation and the completion a new annex. Finally, when the old terminal was razed and replaced with today’s landmark structure, it became Grand Central Terminal. So hopefully, this clears up some name confusion. Check out this great 3-minute video from the History Channel summarizing some of Grand Central’s wonders. If you exit Grand Central on 42nd street and make a left, you can admire one of the most beautiful and iconic Jazz Age skyscrapers in America – the Art-Deco masterpiece that is the Chrysler Building – the world’s tallest skyscraper when completed in 1930, but not for long, since it lost that title on May 1, 1931 – the opening day of the Empire State Building. Getting here: Grand Central is connected to the 4/5/6 subway lines, as well as the Shuttle (S) train from Times Square. The good news is you don’t even have to leave the building to get a good bite to eat. First, there is the popular Grand Central Market where you can get fresh fruit, chocolate, sushi, pastries, and other “on-the-go” food items from local vendors. Enter Grand Central Market from Lexington Avenue at 43rd street. Second, check out the Great Northern Food Hall , adjacent to the Main Concourse, for Nordic-inspired breakfast, lunch, and snack options, as well as a great lunch counter and bar. Hale & Hearty: Popular NYC chain for soups, sandwiches, and salads. Third, there is a great hidden gem called The Campbell Bar inside the Terminal. You can either enter from the street at 15 Vanderbilt Ave, or take an elevator from the ramp next to the Oyster Bar. This trendy cocktail bar occupies the former private office of a 1920s business mogul named John W. Campbell. Today, the beautifully refurbished space is a fancy cocktail bar serving drinks with names like Robber Baron and Prohibition, along with cheese plates and other light fare. Expect a wait to get in the evening hours. Finally, if you don’t mind a short walk and are craving hearty Italian food, check out the House of Lasagna at 334 Lexington Ave (at 39th st). Lasagna is their specialty, as you may have guessed, and the prices are very reasonable for Midtown. There are a couple of great coffee shops within the massive Terminal. Café Grumpy – Just inside Grand Central’s Lexington Passage if you walk in from Lexington Ave, across the street from the Chrysler Building. Joe Coffee – Just inside Grand Central’s Graybar Passage. Easiest to walk in from Lexington Ave as well. Rockefeller Center is another “can’t miss” place to visit in New York City. It is super crowded from Thanksgiving Day to New Year’s Day (78-foot tall decorated Christmas trees tend to draw large crowds), but it is a much more hospitable place the rest of the year. Let’s start by debunking some common misspellings. This is not “Rockafella” or “Rockerfellar” Center. It is “Rockefeller”, as is the Rockefeller oil fortune. If you fill up your car’s gas tank in the United States at Exxon, Mobil, Chevron, or a number of other national gasoline brands, you’re buying from one of the “offspring” companies after John D. Rockefeller’s oil monopoly, Standard Oil, was broken up by the U.S. government in 1911. John D. Rockefeller Sr. (the patriarch that built the oil behemoth and lived to the ripe old age of 97) was so wealthy a century ago that he was the world’s richest man and the first person to be called “billionaire” (again, this is a hundred years ago!). Adjusted for a century of inflation, his fortune at its peak would be worth around $30 billion today! OK, enough about Sr. Let’s talk about Jr. John D. Rockefeller’s only son – “Junior” – is the man behind the famous center that bears the family name. The enormous complex (originally comprised of 14 Art Deco buildings) was the largest privately funded construction project ever undertaken at the time. What’s even more incredible is when it was undertaken – after the Great Crash of ’29! The decade it took to build Rockefeller Center (1929 to 1939) was one of the worst economic periods in New York City and United States history. Imagine how many families were saved from homelessness and starvation thanks to this gargantuan building project. The first Christmas Tree at Rockefeller Center was a modest balsam placed in the rocky and muddy construction site in 1931. The mostly Italian laborers gratefully lined up by the tree to receive their weekly wages. Today, the Tree Lighting Ceremony draws thousands of gawkers from around the world, and millions more watching on NBC. Speaking of NBC, the Today Show, the Tonight Show with Jimmy Fallon, Saturday Night Live, and the Late Show with Seth Meyers are all filmed at Rockefeller Center (30 Rockefeller Center, specifically, for all but the Today Show). The hit NBC show “30 Rock” was based on what goes on in the building, though most of it was filmed on Long Island. Another famous New York sight is the ice skating rink surrounded by flags. The rink, which was first installed in 1936, is one of the most popular tourist attractions in the colder months. And the approximately 200 flags around the Plaza represent countries that are members of the United Nations, as well as some U.S. Territories. During elections, though, the flags are replaced with the 50 State flags. And in December, the flags are replaced with shiny and festive holiday banners. By the way, there is a reason for this U.N. connection in the heart of Rockefeller Center. The land on the eastern edge of Manhattan occupied by the United Nations Headquarters was purchased by John D. Rockefeller Jr. from a private developer and promptly donated to the city, so that the United Nations could set up its headquarters in New York City. Rockefeller Center takes up several city blocks in the heart of Midtown Manhattan and features the largest collection of Art Deco art in the country, one of the largest and most opulent theaters in the world (Radio City Music Hall), and arguably the best views in the city from its observation deck aptly named “Top of the Rock”. You have incredible views of the Empire State Building and amazing views of Central Park to the north – the same (to state the obvious) can’t be said when you’re on top of the Empire State. Last thing, if you find yourself in the area, be sure to walk to Fifth Avenue and check out the famous bronze sculpture of Atlas facing the beautifully restored Saint Patrick’s Cathedral (between 50th and 51st street). 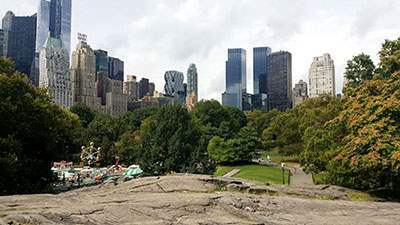 And if you want to tour Rockefeller Center, Grand Central Terminal, Times Square, and other Midtown landmarks, with a professional tour guide on an intimate and informative private tour, check out our private Midtown Highlights Tour. 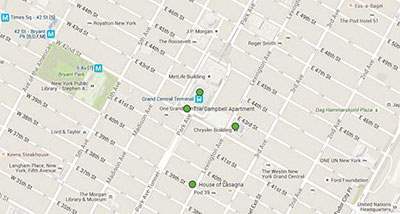 Getting here: B/D/F/M to 47-50th st/Rockefeller Center, or the E line to 5th Ave and 53rd st. The Dining Concourse at 30 Rockefeller Center offers numerous quality options for a quick, casual bite. This is the most convenient option before or after going to Top of the Rock (since you can buy tickets in the same Concourse). There are also many other casual eateries catering to the tens of thousands of daily office workers on the blocks in and around Rockefeller Center. If you want a memorable (and pricey) meal at one of New York’s most famous restaurants & bars, check out the 21 Club, which started out as a speakeasy during Prohibition. Almost every US President, corporate CEO, and celebrity worth his/her salt has dined there. If you’re nice, maybe they’ll show you the secret wine cellar. Even though this list is generally arranged south to north, some might say we saved the best for last. If you are going to visit New York City and not visit Central Park, then you might as well not come at all. A lot of first-timers don’t really know what to expect, besides the snippets they’ve seen in movies and TV shows. Most people think it’s just a big park with lots of trees. And yes, it is a big park – 843 acres to be exact – and yes, there are a lot of trees – about 26,000 – but the park is so much more than that. It is an incredibly special public space in the middle of a very loud crowded island full of daunting skyscrapers. It is a breath of fresh air in a place more known for car exhaust. Here is a relevant fact that will surprise you: Central Park is one of the best bird-watching spots in the United States, with nearly 200 different species visiting or living in the park over the course of a year. Who would have thought? And right in the middle of Manhattan! But that’s just one of the many things that make this park special. Don’t just think of it as something famous to check off your NYC to-do list. It is America’s first landscaped city park (designed in 1858) and is legitimately considered a masterpiece of 19th century art. When you wind your way through Central Park, you are not just waking past meadows, woodlands, and lakes, you are enjoying living landscape paintings without realizing it. Each “scene” was meticulously designed and sculptured a century and a half ago to look a certain way. This brings us to one of the most important tidbits about the park: It’s entirely man-made! The lakes, the woods, the meadows – all created following a design competition of 1858. Before the competition, this was a remote piece of mostly undeveloped land far away from the population labeled “worthless rock and swamp.” Imagine going from a mid-19th century rocky and swampy wasteland to one of the most visited and recognizable city parks in the world today. The only thing about the park that’s not man-made is the rock. The rocky outcroppings you find throughout the park is the native bedrock of Manhattan island, called Manhattan schist. Some of these fairly large outcroppings are popular photo and napping spots. We wonder how many of the locals and tourists who climb the rocks on a daily basis realize they are climbing ancient bedrock scraped by a melting glacier at the end of the last Ice Age approximately 13,000 years ago! On a different note, some people venture in to the park for a few photos, then venture out, lest they get lost. 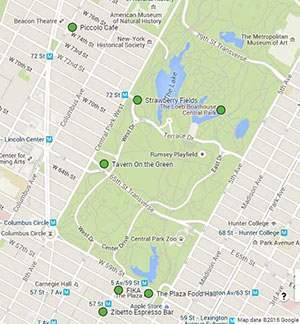 First, it’s OK to get lost in the park today — you won’t get mugged (probably not even after dark). Second, you are supposed to get lost. The park is designed for you to get lost. Because in the process of getting lost on its winding paths (with no street signs to guide you), you are supposed to relax and disconnect from the city around it. And Central Park isn’t just for tourists. Thousands of locals visit the park each day to ride their bikes, jog, walk their dogs, read a book on a favorite bench, or just to be in nature. So if you do get lost, just ask a local for directions. Or if you’d rather not get lost on your own, get lost with us instead on a scenic and informative private 3-hr walking tour of Central Park. Getting here: If entering from Central Park South – N/Q/R to 5th and 59th or A/B/C/D/1 to Columbus Circle. Piccolo Café – 313 Amsterdam Ave (between 74th and 75th st): Popular hole-in-the-wall Italian café serving good coffee, wine, and light Italian fare, and just a 10 minute walk from Strawberry Fields. Tarallucci e Vino – 475 Amsterdam Ave (corner of 83rd): Popular Upper West Side Italian café and wine bar close to the west side of the park if you exist at 81st street (by the Natural History Museum). Bigger than Piccolo and another great option for good Italian coffee, wine, and light fare. Outdoor seating is available in the warmer months. Lakeside Restaurant at the Loeb Boathouse – A beautiful restaurant & bar with lakeside views and high-quality lunch and dinner options (as well as weekend brunch), if you can actually get a table. There is also a much cheaper casual café next door for “fast food” type fare. Tavern on the Green – Enter at 67th street and Central Park West: This famous restaurant in a historic building built in 1870 as the Sheepfold (thus the sheep in their logo) was beautifully renovated a few years ago. In the warmer months, there is also a great outdoor seating space. A nice lunch or dinner option if price isn’t an issue, or just a nice/fancy place to cool off at the bar with a beer on a hot day. Le Pain Quotidien – Just north of Sheep Meadow, this cozy Belgian café chain serves soups, salads, tartines, coffee, and more. There is a small outdoor seating space as well. A great option for a casual lunch and people-watching that won’t cost nearly as much as the first two options above. Phew! You just completed our 10,000-word guide. Thank you for reading it. We hope you’ve found it useful. CLICK HERE to get it as a free PDF in your inbox. And if you have any questions or comments, feel free to drop us a line at [email protected].